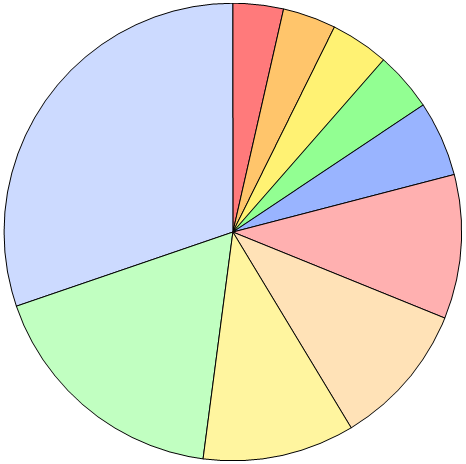 Donut chart is a popular form of visualizing categorical data, just like a pie chart, to demonstrate the relationship of each segment to a whole. 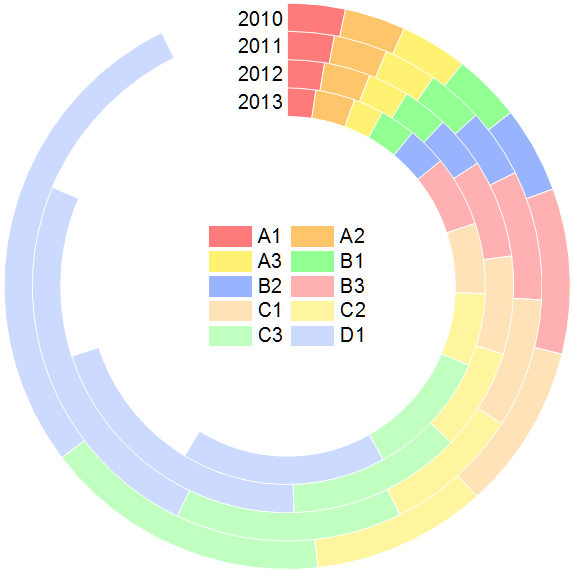 A donut chart can contain more than one data series by adding more rings onto the chart. Because of its circular nature, the proportions of outer and inner rings do not represent the size of the data accurately, that is, data points on outer rings may look larger than those on inner rings while the actual values might be smaller. 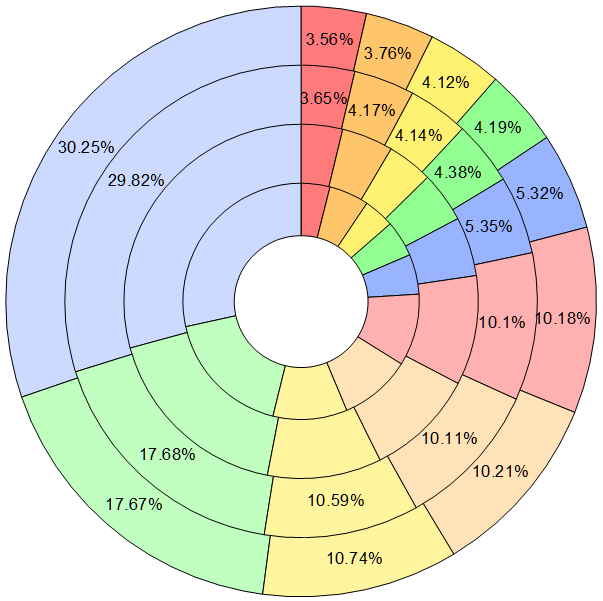 Origin does not have built-in template for donut plots creation, but we can stack several pie charts up to make a donut. Open the linked opj file in Origin and go to Folder1. 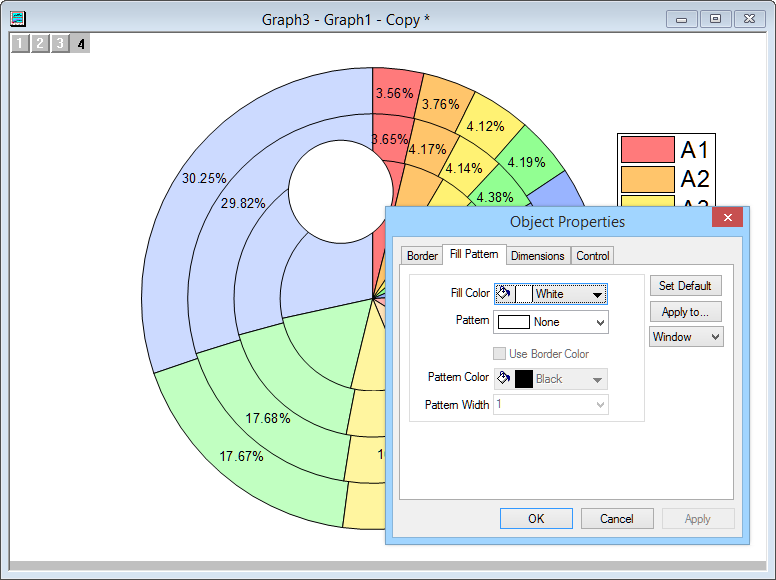 Highlight Column F and plot a 2D pie chart (Plot: Column/Bar/Pie: 2D B&W Pir Chart) and do some customization in Plot Details dialog. Such as on Pattern tab, set the Fill Pattern to be None and Fill Color to be Incrementing with Customized Color List. On Label tab, uncheck Percentages to hide labels. Remove legend, etc. 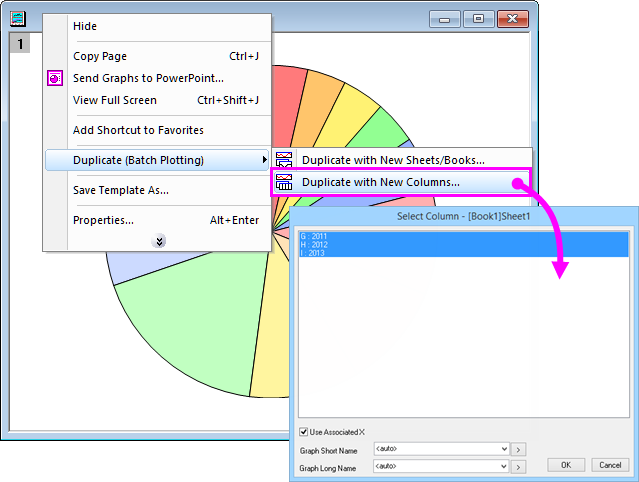 Right click on window title bar and select Duplicate(Batch Plotting): Duplicate with New Columns. In Plot Details dialog of each pie graph, set Pie Geometry: Radius/Center: Rescale Radius (% of frame) to be 100/80/60/40 respectively. And give each of them a short name (for example, F2010, F2011, F2012, F2013). 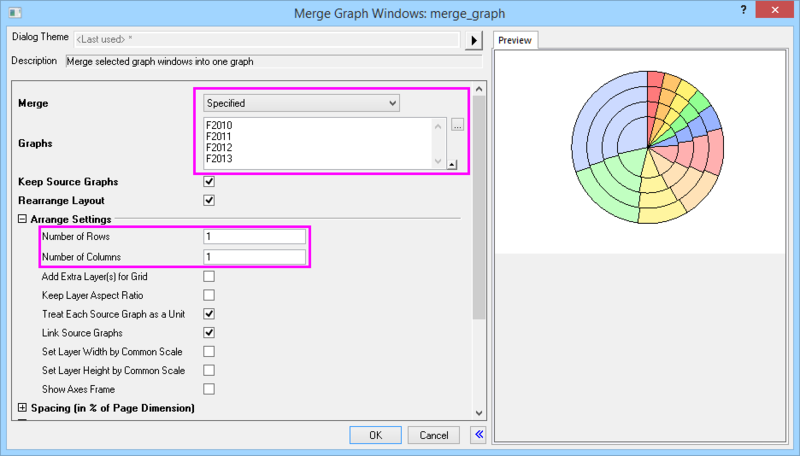 Open menu Graph: Merge Graph Windows. Set Merge be All in Active Folder (Open). If the order of the graphs appears incorrectly, switch to Specified mode and re-order the list. Set Arrange Settings: Number of Rows/Columns to be 1, then click OK. In Layer4, add a white circle shape (hold Ctrl key and resize to make it circular) and move it to the center (use Origin’s align tool bar buttons). Some further customization to finish the graph (Graph1 in Result Folder). You can also set a shared upper bound by adding an extra row of data (Book2 in Folder2). how can i get the last graph, please list the details. Thank you. Add an extra row represents the empty space on the desired graph and make sure all columns will sum up the same. Please go to Folder2, Book2 to check my “Other” row. When plotting, set that segment’s border and fill color to be white, of course. how can i get the last graph, where is the Folder 2? please listed the details. Expand “Project Explorer” and you will see the other folders. One of many totally helpless instructions. These steps are self-explaining. But all interesting questions are not addressed. How do I manually change the single colours of different areas? How do I choose the angle so that one line of the pie is perfectly perpendicular? You should really get rid of these oversimplified tips. Improve your program and avoid unnecessary fret. 1). 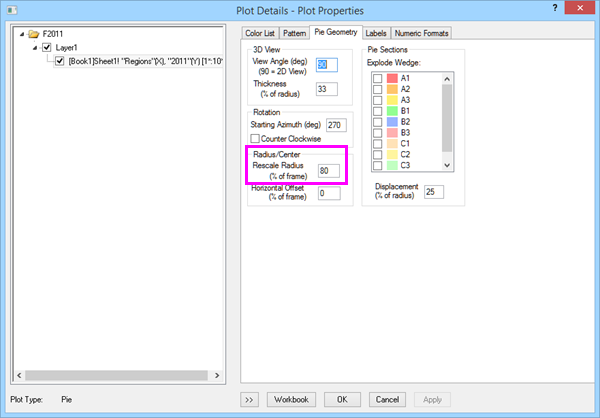 Hold Ctrl key and double click the fragment that you want to customize individually, and set the fill color in the opened Plot Details dialog. Or modify the increment list to change the color for one of the categories globally. 2). Open Plot Details dialog, Pie Geometry tab, give Starting Azimuth (deg) the value you want.